Is it a spooky jack-o-lantern, a ghost, or some other sort of specter? Turns out it's nothing scary at all - unless you are afraid of black holes possibly crashing into each other. This is, in fact, an image of the core of M87, a galaxy in the constellation of Virgo. 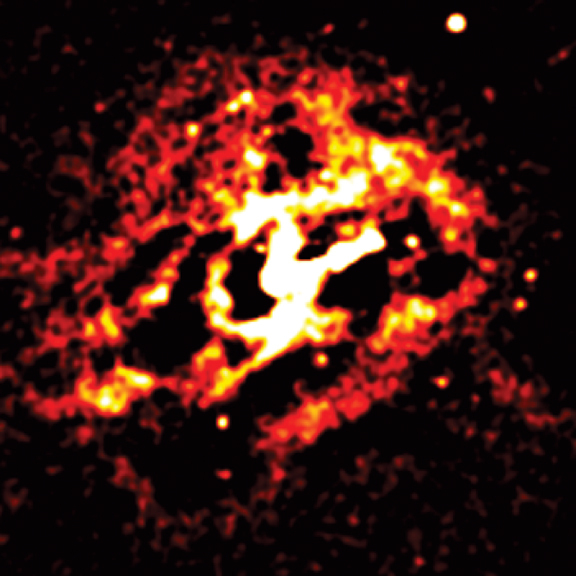 Scientists have specially processed Chandra's X-ray data to reveal the presence of what they believe to be three rings associated with the galaxy's core and jet. If these rings are real, then scientists will need to come up with more than a ghost story to explain them. One possible explanation for the triple-ring structure is the merger of two spinning, supermassive black holes. Coordinates (J2000) RA 12h 30m 49.40s | Dec +12° 23' 28.00"